Get the most from your mountain hike with these handy tips! Hiking mountains is one of the best ways to connect with nature, offering sweeping views of pine-fringed peaks and stark rock cliffs from high above tree line. But even a day hike in the mountains takes thought and planning, even if you're just heading out for a few hours or a day on marked trails not far from a resort or town. 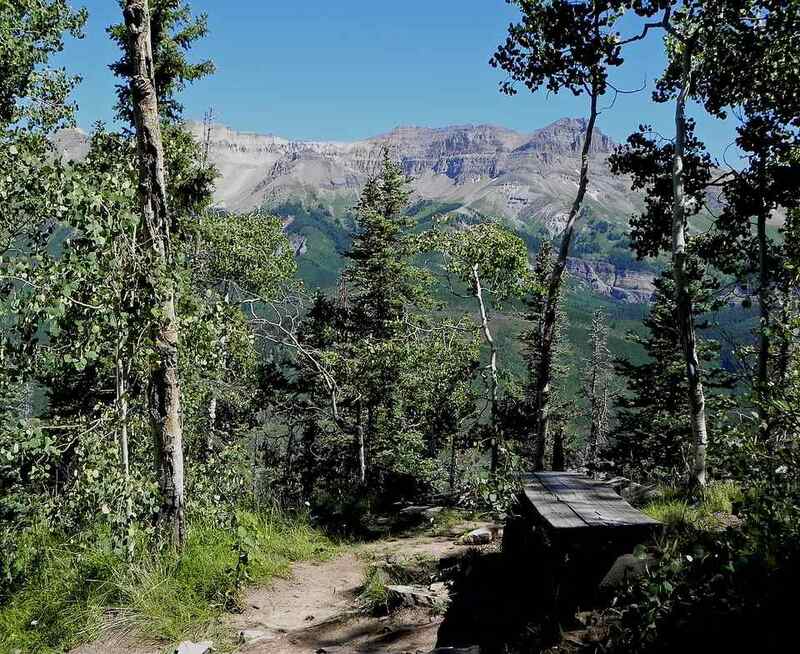 As I hiked on the Ridge Trail at Telluride, the only sounds were the clacking of the cicadas, shrill tweets of unidentified birds, and the shivering of the aspen leaves as the wind swept through the leaves. Flashes of light often crept through thick pines, highlighting tiny purple flowers at my feet and patches of green lichen on fallen logs. A distant view through the thick trees that towered 50 to 60 feet overhead revealed sheer, striated cliff bands still capped by snow, even in July. I met just one other group of hikers on this usually popular trail, so while I walked along by myself, some hiking tips began rattling through my mind. These are some of the things I've learned on similar treks over the years and ones to keep in mind when heading out for a mountain walk of your own. Before starting, get information about the trail you want to take at a local tourist information office, a Forest Ranger's station, or a local store that sells hiking and biking gear. Take any buff local hiker's advice carefully; if he or she says the trail is easy, it may be for them but not necessarily for desk-anchored city folk who may not be accustomed to the altitude. Choose trails carefully to ensure that young children can't get in trouble. On some trails, it is easy for them to get lost in the woods or wander to close to the edge of a cliff. Decide in advance if you want to spend most of your time hiking uphill, downhill, or both. Sounds obvious, yes? But, take the Ridge Trail as an example as something that isn't readily apparent. The name and the map suggests you are walking on a ridge line high on a mountain slope. While that is true, I chose the route (unknowingly I admit but happily I later realized), that was almost entirely downhill. I learned this from the group I met while on the trail, who had been steadily climbing since they started at the other end. Even their dog was panting heavily. Always check the local weather forecast to see if thunderstorms are predicted and avoid heading out into the mountains if severe weather is possible. If it starts thundering and lightening, seek shelter immediately and turn back as soon as you can. Some trail maps, especially at resorts, indicate whether the trail is just for hikers, only for mountain bikers, or for both. If you prefer a bit of solitude and not having to worry about constantly moving a few steps off the trail so riders can go past be sure to pick your trail accordingly. We're all told that we should never hike alone. This is certainly true in the backcountry where the chance of getting lost or injured are much higher. On resort trails, however, it is not uncommon for visitors to hike alone. In either case, always let someone know exactly which trails you are planning on taking, when you expect to start and when you plan to return. If you hurt yourself and can't get back to the trailhead, people will know where to start looking for you. This simple piece of advice can actually be the difference between life and death. Always bring several layers of clothing. When it's in the 80s at the base of a mountain the temperature up top, potentially several thousand feet higher, will be cooler. If you start out in a t-shirt, toss a long-sleeved shirt, a fleece, and spare socks in a daypack or a hip pack. Lightweight rain gear is handy as well because rain can arrived unexpectedly in the mountains. Wear shoes with a good grip, because most trails are a mix of rock and dirt. Over the ankle hiking boots can offer extra support –– and prevent a sprained ankle –– while hiking on uneven and unsteady terrain. Trekking poles are highly advisable when heading out for a mountain trail as well. These walking sticks provide added support while both ascending and descending, and can offer added stability on the trail. They are especially handy when crossing streams and rivers and can definitely help lighten the impact on your legs after a long walk. Bring a small first aid kit, a flashlight, a compass, and a map. This may sound low-tech, but there are places in the wilderness where you can't get a cell signal and the GPS or other apps on your smartphone won't be available to you. When all else fails, take a look at the 10 essentials of hiking to know what you should always bring with you on a hike. Always bring food and water with you on any hike, even if you're only going to be out for an hour or two. At altitude, you may find yourself dehydrating more quickly and you'll be burning plenty of calories on the walk too. Plus, if an emergency situation should arise you'll be glad you have some food and water to help see you through. When you wander into the mountains you're also wandering into the habitat of many wild animals. It is not uncommon to come across elk, deer, moose, bears, or even mountain lions while out on a hike. For the most part, those creatures are content to let you wander on by, but it is good to be cautious none the less. Some hikers will tie a small bell to their packs to alert animals to their approach, others will sing or talk loudly. This alerts them to your presence and gives them time to move away. Startling a wild animal can result in a dangerous encounter, and in order to stay safe we want to avoid that at all costs. These are just a few of some important tips to keep in mind while hiking in the mountains. Keep these things in mind and you'll stay safer and better prepared. Above all, have fun and enjoy the walk. Taking a walking tour of Japan to blend history, culture, and scenery. Planning a trekking vacation? Here's how to get in shape before you go!